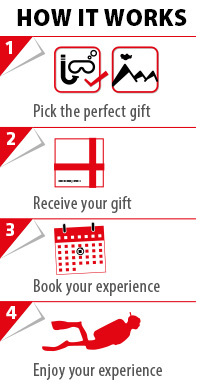 Browse through our categories to find your perfect present or treat yourself to something you've always wanted to do. We have categorized gifts by occasion, by recipient, and by theme. You can also use a keyword search on the homepage. When you have decided on a present that you wish to give or get for yourself, add the gift to the basket and then proceed through the checkout. You will then be asked to fill in a special greeting form. You'll receive an order confirmation at the end of the checkout confirming all your details and what you have purchased. Your gift will be sent as an instant eye catching e-Voucher to your own inbox or to your recipient’s inbox. Or else you can select an option of receiving our stylish new branded gift voucher by post. We would send it to you or to your recipient’s home address in a plain brown envelope so not to spoil any surprises. In the envelope you would find a gift pack containing your beautifully printed voucher, your message or a greeting, an information sheet detailing your experience and the booking details. Before booking your experience you should redeem your voucher on MyGift.ie website. All you need to do is to click the “Redeem your voucher” button on the top right side of the MyGift.ie homepage and follow the instructions. To book your experience, simply use the contact details provided on the website version of your voucher (the one that you see after redeeming your voucher). 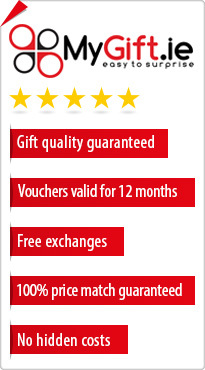 When talking to the gift provider, please mention that you have received a gift from MyGift.ie. They might ask you for your voucher code. By the way, in most cases your voucher will be valid for 12 months and your voucher should be booked and used within this time. It's the day of your experience and this means that it is a time to have fun! For some gifts we advise you to check weather conditions with the supplier before you leave home. If so, just a quick call will make sure you don't ruin your day! We wish you to have a wonderful time on your experience and would love for you to leave us feedback to tell us how great your day was!